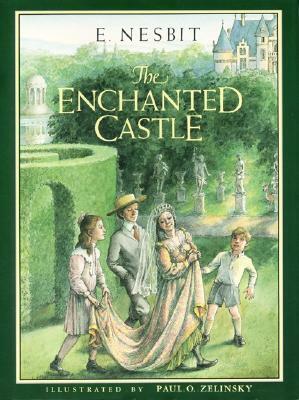 My newest fantasy read is The Enchanted Castle by E. Nesbit, originally published in 1907. During a holiday from school, three siblings, Gerald (Jerry), James (Jimmy), and Kathleen (Cathy) are staying with a French governess who, because of Jerry's knack for talking to adults, gives them a lot of freedom to go off exploring on their own. On their first excursion, the three stumble across a castle, and in the castle's garden, a sleeping princess. The princess tells them of an enchantment that was placed over the castle, but just as the three children begin to believe her story, she puts on a magic ring and turns completely invisible. Once she realizes no one can see her, the princess reveals her true identity: Mabel, the housekeeper's daughter. The four children work together, first to make Mabel visible again, and then to figure out the rules of the magic ring. I am sure it is no surprise to anyone that my favorite elements of this book are of the real world, and not the fantastical. I like the way the children interact with each other, and the way their personalities come across in dialogue. I like their smart comments about the behavior of adults, and Jerry's cockiness, even in the face of dire circumstances. I like the way the magic annoys and frustrates the characters as much as it would me if I were in their shoes. I could get into this book easily because of these very real and human attributes. What I had trouble with is the magic. The fact that the ring allows its wearer to become invisible, or to make wishes is not really the problem. But the explanation of the origin of the magic, which involves sentient statues and Greek gods, and lots of poetic language about the moon, and space, and light - it makes me roll my eyes. The writing is great, but once the story separates even a bit from that day-to-day banter amongst the kids, it loses me. I think, even after I finish this project, that may always be the case. Still, despite my issues with magic, I got through this book very quickly. The kids take the entire book, almost, to figure out how the ring actually works, so there are lots of surprising twists and turns that keep things interesting and unpredictable. I was always eager to know what the ring's next trick would be. (And I also thought it was fun that one of the kids suggests using the ring to become a burglar. This book was published 30 years earlier, but that moment made me think immediately of The Hobbit.) There are also lots of great lines from the kids that hint at Nesbit's understanding of how kids and adults view each other, and also of how young boys think of girls, and vice versa. One quote that jumped out at me is from page 60: "The more there are of children, the younger they look, I think, and the more people wonder what they're doing all alone by themselves." This struck me as both funny and true, especially in light of the case of the local free range parents whose kids were picked up twice by police for being on their own. It's amusing - and comforting, in a way - to realize that problems with trusting kids on their own are not new, but at least 100 years old. "No, but we'll do the babiest thing we can do the moment we get home. We'll have a dolls' tea party. That'll make us feel as if there wasn't really any magic." "It'll have to be a very strong tea party, then," said Kathleen, doubtfully. This little snippet makes me laugh because of how adult the girls sound, even when they are discussing something as childish as a tea party with dolls. Nesbit has a knack for writing lines like this that show how much smarter kids are than adults often realize. The Enchanted Castle is similar - at least in terms of subject matter - to Edward Eager's Half Magic, and The Knight's Castle, as well as to contemporary books like Bigger Than a Breadbox and Any Which Wall by Laurel Snyder, All the Answers by Kate Messner, and Dreamer Wisher Liar by Charise Mericle Harper. In terms of writing, though, Nesbit is far superior to these others, and her writing is surprisingly accessible even though the children she was writing for are long dead. This book is a good choice for kids who already like fantasy, as well as for those who are skeptical, but want to give it a try. This short month flew right by! 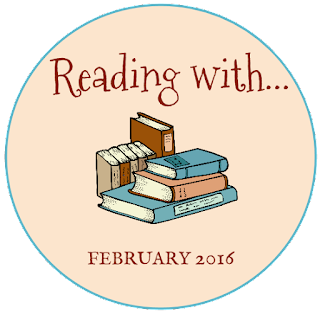 Here are some notes on what Little Miss Muffet and Little Bo Peep have been reading lately. As Miss Muffet struggles her way through the highs and lows of the terrible twos, she is really enjoying books about children who misbehave, but are loved and forgiven by their parents all the same. She requests multiple daily readings of Harriet, You'll Drive Me Wild by Mem Fox, a used copy of which we bought at a local book sale several months ago. Realizing how much she enjoyed that book, I grabbed a copy of No, David the next time we visited the library, and she quickly memorized the text of that as well. We have had the book almost three weeks now, and frequently she can be heard "reading" it aloud to her beloved baby doll. I think this is the first time I have really seen her connect with the emotional experience of a character in a book. Harriet and David clearly comfort her during the times when she is driving her parents wild - and we can also talk about her behavior in terms of what happens in those books. Miss Muffet is still really interested in singable books. We checked a few out of the library on our last trip, but by far, her favorite is Sing, Tom Lichtenheld's adaptation of the famous Sesame Street song by Joe Raposo. The early part of the story is wordless, which she likes because she can read it by herself, and then it goes through the song, a few words at a time as a guitar-playing boy helps a little bird gain the courage to sing its own tune. I was not crazy about this adaptation when it first came out because it didn't fit with my nostalgic feelings about the song, but after reading it dozens of times, I have to admit it is growing on me. Poor Little Bo Peep doesn't get nearly as much reading time as her big sister did at her age. I don't worry about it much, because even when we're not talking directly to her, she is still surrounded by all of us talking, reading, and singing all day long. Still, having a second child does make me realize how truly unrealistic many early literacy tips are for parents. I see these tips in many places around the web - blogs, library websites, emails from my library system, etc. - and I recognize the good intentions behind them, but many of them show a gross misunderstanding of what caring for small children is really like. For example, singing to a baby during every diaper change sounds like a lovely idea, but in practice, diaper changes are rarely these calm bonding moments. Rather, the baby's diapers are changed quickly before her big sister finds something to climb, break, or throw away. I wish libraries would stop trying to prove how important they are by always trying to come up with the next new clever literacy tip, and instead just focus on showing people how to have fun with books. Every family can find a way to do that, no matter how many children they have. 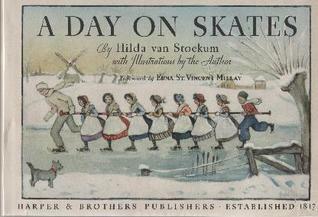 Published in picture book format, but written at the middle grade level, and divided into chapters, this brief tale tells of Dutch twins, Evert (a boy) and Afke (a girl), who go with their classmates and Teacher on a day-long skating picnic. The ordinary day is punctuated along the way by various extraordinary happenings, including an encounter with a real artist, an injury, a feast of snow pancakes, and an accidental imprisonment inside an old church. This book is a lovely slice of life tale, which is similar in some ways to Thimble Summer (1938) and Strawberry Girl (1945). Like these other titles, A Day on Skates gives a sense of the landscape and customs of the region in which it is set (Holland), while also celebrating the joy to be found in everyday events and experiences. Though it is a bit hard to believe that everything which happens in this story could truly occur to one class in just one day, the story is so charming that the reader really wants to believe in it, and easily finds herself pulled along on their journey. I was pleased to discover that the Foreword to the book was written by Edna St. Vincent Millay. She has been a special favorite of mine, as we attended the same college and also both spent the summer between our junior and senior years at the same mountain resort some 85 years apart in time. I wondered at first why this accomplished poet was interested at all in a children's book, but my husband informed me that Millay is van Stockum's aunt by marriage. I especially enjoyed her opening line: "This is a book which mothers and fathers will sit up to finish, after the protesting child has been dragged firmly off to bed." The writing in the story proper starts out very poetic and old-fashioned, with a meditation on the arrival of Father Frost during the night. I didn't dislike this, necessarily, but it is markedly different from the rest of the text, which is much more grounded and more appealing. Van Stockum's true talent is for capturing the importance of little things, so the moments focusing on exchanges of dialogue, or the details of food and clothing, are much more engaging, and they are what made me finish the book eagerly in one sitting. What really makes this book so wonderful, though, are the illustrations. There are eight full-color plates, including the frontispiece, as well as black and white line drawings scattered throughout the book's six chapters. The color illustrations look like vintage Christmas cards, with their picturesque winter landscapes and crowds of young skaters dressed in old-fashioned cold-weather garb. They are all equally well done, but the picture below, from Chapter 5, is probably my favorite. 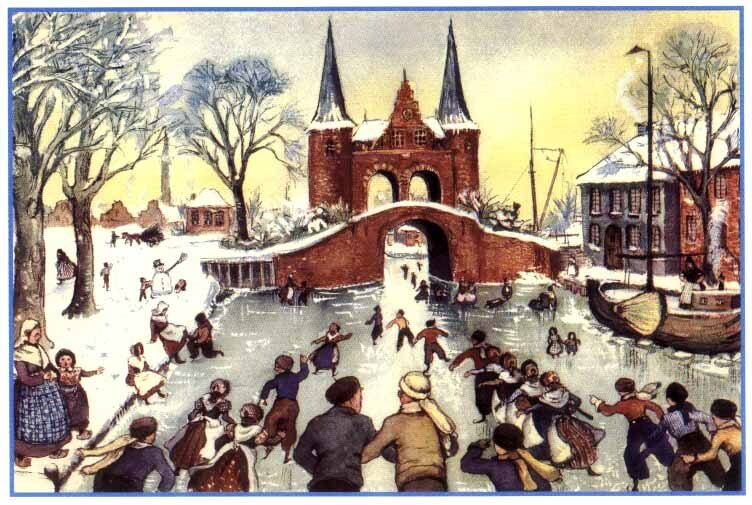 I love the way the skaters form a triangle, drawing the viewer's eye under the bridge, and how the background details, such as the kids building a snowman, seem to be telling stories of their own that are never referenced by the text but are part of the book nonetheless. The level of detail in these pictures shows how well van Stockum knows her characters, and they add a dimension of personality to the story that is not quite captured by the text. A Day on Skates is out of copyright and can be read free online. It's a quick story that can easily be finished in an hour, and it's perfect for those days when it's too cold to do anything but cuddle up in bed in your pajamas. The Dutch names make it a little tricky to read aloud on the fly, but the hardcover edition does have a pronunciation to help readers practice before sharing the story with a group. I highly recommend this book, and look forward to the day my girls are old enough to enjoy it with me. Mississippi "Mibs" Beaumont and her siblings are different from other kids. In their family, when a child becomes a teenager, he or she develops a savvy, a supernatural power that enables them to do things like control the weather, capture radiowaves, or move mountains. 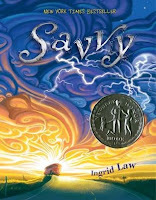 When their father is seriously hurt in an accident on the day before Mibs's thirteenth birthday, her savvy is all but forgotten by the rest of her family. When she wakes up on her birthday, she is convinced that her savvy will be something that can save her dad from his coma. It is only after she runs away, taking along two of her siblings and the local preacher's kids, and hitching a ride in a Bible salesman's bus, that she realizes perhaps she has misunderstood what her new power actually is. This is one of the books I most wanted to read when I started this project, but I'm sorry to have wasted my time. Despite being over 300 pages long, this book has absolutely nothing to say. The characters and their savvies are not particularly interesting, and though the father is obviously in serious condition, I felt none of the kids' urgency for saving him. The writing is almost completely devoid of real emotion; rather, everything feels manufactured and forced. It is appalling to me that this was a Newbery Honor book (in 2009, the year that The Graveyard Book received the Medal.) I just can't imagine a room full of people loving such a bland and disappointing story. I can usually recognize the merit in a Newbery book, even if I don't like it. I see absolutely nothing in this book, and it truly puzzles me to see so many positive reviews of it on other sites. A Tangle of Knots and the Quirks series both have very similar premises to Savvy, and both are infinitely better written and more satisfying. Kids who are interested in reading about everyday kids with extraordinary powers would do better to look for these alternate titles and avoid Savvy altogether. Ingrid Law may have introduced the subject matter first, but these other authors do it better, and more memorably. 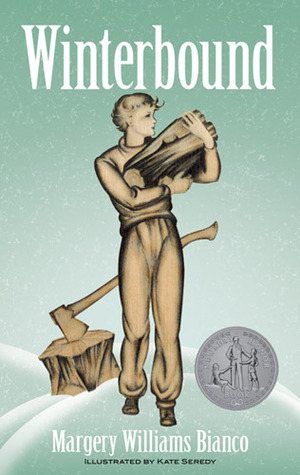 In this 1937 Newbery Honor novel by Velveteen Rabbit author Margery Williams, teen sisters Kay and Garry have moved from the city into a farmhouse in Connecticut with their mother and younger siblings, while their father goes on an archaeological expedition. When their mother is called away to nurse a sick relative, the two girls are left to care for the household through the brutal New England winter. This novel of the Great Depression is a wonderful family story populated by memorable characters. The artistic Kay and science-minded Garry take turns as the focal point of the book, and their concerns about their personal interests are as compelling as the difficulties they face in keeping warm and surviving the difficult winter conditions. Their personalities are strong and compelling, and especially enjoyable to read are their encounters with "The Cummings," an older woman who is sent to babysit them, and who does not last long in her post, and with a writer to whom they rent a room when they find themselves in need of extra money. Despite its age, this book has a very contemporary flair to it. It is similar in tone to family stories like those in the Bluebell Gadsby and Casson Family series, especially in terms of the very familiar and affectionate way the children relate to their mother. It also has much in common with other stories of teens taking over their households and working to survive on their own, namely Hattie Big Sky and Strong Wings. The writing is excellent, with believable dialogue, several interesting subplots, and prose that is beautiful without being overly purple. Though the intended audience is probably teen girls, the content is appropriate for younger readers as well, as long as they have some context for understanding life during the Depression. Allie, who lives with her widowed mom in a boarding house, hates endings and saying goodbye. She hates it when her mother makes her clean out her room and part with items she has had for years. She hates it when she begins spending time with a little baby in her neighborhood, and he moves away. And she hates the thought of having to say goodbye to anything else. When free-spirited aging actress Wanda Lenya takes a room in the boarding house, however, she begins to help Allie see that saying goodbye is not a tragedy, but just a natural part of life. I have always known Crosby Bonsall as the author of easy readers such as The Case of the Hungry Stranger, The Day I Had to Play with My Sister, and Mine’s the Best, but it wasn’t until this book showed up at a local used book sale that I learned that she (yes, she) also wrote a novel! I’m disappointed that I didn’t know this sooner, as I think this book would have been a favorite had I discovered it in childhood. I was very much like Allie in terms of her fears about having to say goodbye, and I think this story would have been a help and a comfort. If I had to describe this book in one word I would probably choose offbeat. Allie is not a typical kid, and her quirkiness permeates the entire story, making it a book for a very specific reader. Though there isn’t much to the plot - and the message is a bit cheesy and heavyhanded - there are many moments that stand out as memorable. Despite her strangeness, Allie comes across as very real, and her interactions with others, even the larger-than-life Ms. Lenya, ring true. Descriptions of Allie’s bedroom before her mother makes her clean it, and of the Independence Day celebration near the end of the book are especially delightful and stayed with me long after I finished the story. The Goodbye Summer is similar in tone to Louise Fitzhugh’s books: Harriet the Spy, The Long Secret, and Sport (which was also published in 1979). Allie also reminds me somewhat of the misfit girls Ursula Nordstrom writes about in The Secret Language. It also makes a nice read-alike for Tara Altebrando’s contemporary middle grade novels, especially My Life in Dioramas. Jeremiah, whose health is fragile because of a heart transplant, loves baseball but is not physically able to play. When he and his adoptive father, Walt, move to Hillcrest, Ohio for Walt’s job (which involves programming robots), Jeremiah finds that the town is struggling to maintain a baseball team after the death of a teen player and the discovery of a steroids scandal. Never one to give up hope, Jeremiah decides to bring baseball back to Hillcrest by starting up a new middle school team and stepping up to be its coach. It is so hard to find a book with a truly happy main character, but Jeremiah is one such rare figure. Though he has his share of problems (in addition to the heart transplant, he was also abandoned as a baby), he has an indomitable spirit, and he uses his positivity to reach out and encourage others. Somehow, though, unlike other books that try to be inspirational, this one never feels cheesy. Jeremiah’s voice is strong, his personality is fun and quirky, and because of his unusual experiences, he is wise beyond his years in a way which is charming, rather than annoying. Walt said when I was little and couldn’t sleep, he’d sing me the Michigan fight song. He’s such a bad singer, I think I went to sleep to protect myself (p. 100). Author Joan Bauer also makes great use of the eagle as a metaphor in this story. Jeremiah’s birth mother leaves him with a stuffed eagle, which he calls Baby. Jeremiah spends a lot of time watching eagles on the Nature Conservancy’s Eagle Cam, and they provide him with inspiration. Finally, Jeremiah gives his baseball team the name of the Eagles, due to his belief that they can learn to soar. This is one of the best baseball novels out there, and though Joan Bauer has previously mainly targeted a female audience, this book really will have universal appeal. 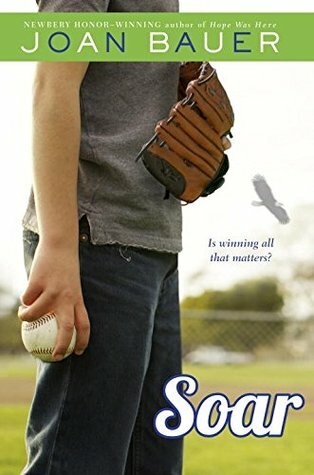 Recommend Soar to readers who like Fred Bowen’s sports stories and/or those who have loved The Toilet Paper Tigers, About the B’nai Bagels, and Plunked.